We all adore that feeling of getting into bed of a night, especially after a long and strenuous day. However, is your room feeling a little cluttered? Do you wish it was more organised and a little less jumbled? Storage should be as inconspicuous as possible in a bedroom, allowing your bedroom to be the perfect retreat. If the disarray of your beloved space is keeping you awake at night, why not follow our tips for making your bedroom that little bit more organised? Seasonal stashes – If it’s the midst of the colder weather, and your wardrobe is littered with vest tops and shorts, store them away for the warmer weather. If you don’t, your wardrobe will undoubtedly feel cluttered and disorganised. By having a seasonal rotation, your wardrobe will breathe a new lease of life each season, allowing you to have more space and feel more structured. Prioritise – Do you really need that jumper you haven’t worn in two years? By having a good old search through your clothes and other items, you can decide what you really need to keep, and what you are potentially hoarding to never be used again. Make accessories accessible – If you’re a fan of scarves, hats, and anything else that you wear day to day, having them in a drawer will make them less available, and you’re much likely to grab the first thing on the pile too if you’re in a rush. In your wardrobe, display them on a shelf in neat piles or in a wicker basket. Seeing the array of colour and choice on a morning will be so much easier, allowing you to colour coordinate with your outfits too. Maximise hidden storage – Areas out of the way of the eye, such as under the bed, are great for storing away things you don’t use, whether it be seasonal clothing, or presents you’re waiting to wrap. To keep it neat and easily reachable when you need them, put them in suitcases or specially designed under-bed storage with wheels. Look out for hanging storage too, and hang one of these on the back of your bedroom or bathroom door. 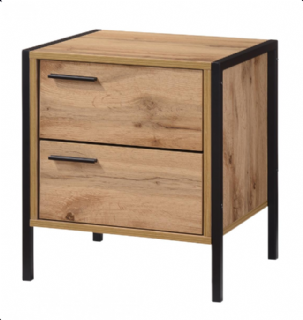 Drawers for wardrobes – If you have quite a big wardrobe but seem to have a lot of wasted floor space inside, why not invest in a set of drawers like the Loft Oak Bedside Cabinet that will go in your wardrobe? They are ideal for sorting all your necessities into places where you need them, making your space a lot more organised, and hiding any clutter from your bedroom too. Loft Oak Bedside Cabinet, from www.hampshirefurniturecontemporary.co.ukSee-through boxes – Boxes are great for items such as shoes, and also keeps them free from dust and other odds and ends, too. Stack them at the side of your wardrobe, and feel more organised in an instant. Coordinated hangers – When hanging up your clothes, use matching hangers instead of the complimentary ones you receive with a purchase from your department store. Wooden ones are ideal, and not only make your wardrobe feel more organised and sleek, but take care of your clothes, too. They also last a long time. By following some of these tips, you’ll have a fresh spacious bedroom in no time, making it your perfect night-time sanctuary.